Mayor Bill de Blasio announced $250 million for Mitchell-Lama buildings at the Ryerson Towers complex in Clinton Hill on Thursday. CLINTON HILL — As part of his expanded affordable housing plan, Mayor Bill de Blasio announced that the city is setting aside $250 million for one purpose: persuading Mitchell-Lama complexes to stay affordable, at least for another 20 years. At the Ryerson Towers in Clinton Hill on Thursday, the mayor announced the new fund as part of a series of programs that will help the city meet a new goal of preserving or creating 300,000 affordable apartments in New York by 2026. The $250 million is earmarked to give money for loans, tax breaks and fund repairs to Mitchell-Lama complexes across the city, with the caveat that those who use the money will agree to keep the buildings in the program for another 20 years. De Blasio said the pressures to privatize apartments in the Mitchell-Lama program are increasing; over the last 30 years, he said, approximately 20,000 such units in the city have left the program and become market-rate. “We can’t let that happen anymore. There are about 45,000 apartments in this city in Mitchell-Lama buildings that now are threatened with falling out of affordability and going market-rate. Our job is to stop that,” he said. Mitchell-Lama complexes, named for a 1955 state law that created the affordable housing program, offer subsidized cooperatives and rentals to New Yorkers across the city and state at below-market prices. Units in buildings within the program are sold or rented to residents through waiting lists, which are often closed or years long due to demand. The board of a building near the Ryerson complex, 21 St. James Pl., began a feasibility study of going market-rate last year. Residents voted the measure down, but the board may make another privatization push again soon, and those living in Ryerson said their neighbors' ordeal has put pressure on them to privatize as well. The mayor does not have the authority to preserve or expand the Mitchell-Lama program itself; that power rests with the state legislature. But Adele Niederman, president of Cooperators United for Mitchell-Lama, said the new city funding is “crucial” for convincing boards to stay in the affordable housing program by providing much-needed financing for major fixes — to elevators, windows, heating systems — while keeping maintenance fees low. “You can’t use the money and [then] say five years later, bye-bye! It’s an incentive,” she said. 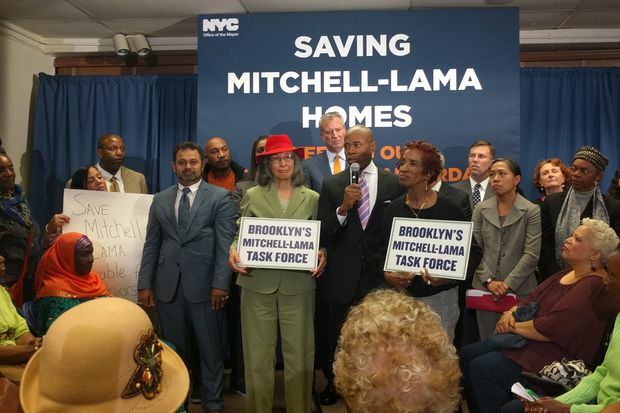 Dealice Fuller, a resident of the Lindsay Park complex in Williamsburg for more than 40 years and a member of the Brooklyn Mitchell-Lama Task Force, said there’s a huge need for the money for maintenance at many buildings, including her own. “We’ve been here over 50 years and the board has not put money into reserve to make sure we get the capital improvements that we need. Our piping, our facade … everything needs repair now,” she said. The city says the $250 million will target about 15,000 Mitchell-Lama homes over eight years, both at resident-controlled cooperatives and at rental complexes. Currently, about two-thirds of the city’s 100 Mitchell-Lama complexes are cooperatives. The remaining third are rentals. CORRECTION: A previous version of this story stated that a building within Ryerson Towers, 21 St. James Pl., voted down a measure to privatize last year. The St. James Place building that considered the privatization measure is in fact a Mitchell-Lama cooperative neighboring the Ryerson complex, but not part of it.